Heliconia rostrata (Hanging Lobster Claw) is an easy plant to grow in Florida and humid/warm areas. The bloom is very impressive and generally speaking, it requires little maintenance. However, it is best sited in areas protected from strong winds. Otherwise, the leaves can get tattered over the windy winter months in Florida. This doesn’t stop the plant from blooming- it will grow right along with tattered leaves no problem- it just requires a “haircut” to deal with the aesthetics! 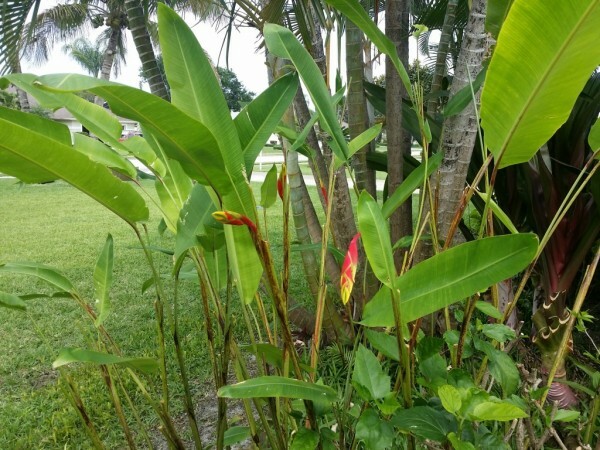 I have plenty of Heliconia rostrata throughout my garden in wind protected areas. I pretty much do nothing for maintenance on these, as the leaves look fine year round. The only trimming I do is removing old stalks after they have finishing blooming. I do, however, like to have some out in the front yard so I can show off the blooms. This location gets quite a bit of wind over the winter (January-March seem to be the months that get intense winds) and it can tatter up the leaves. I used to worry about this, but over the years I have developed a cleanup strategy that works quite well and doesn’t require alot of work. Basically, over the winter I do *nothing* with the plant- I just let it sit there and get blown around in the wind. Granted, there are a few palms, my house and some Hibiscus around it, but it gets plenty of wind exposure. Around early February, I apply some fertilizer- liquid (Miracle Gro usually) and some granular (Osmocote) to give it an early push for new leaves. February and March still have stiff winds, so I don’t bother to do any trimming yet- I let the older leaves take the wind and form a bit of a buffer. By late March/ early April the plant is pushing out nice new growth and the winds have calmed down. Usually there are plenty of blooms beginning to peek out. This is my que to go out and trim. 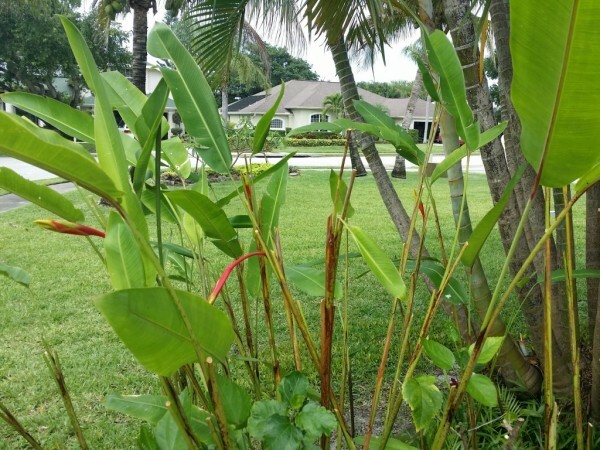 I use ordinary household scissors (I wear gloves to avoid blisters) and cut off any old, tattered leaves, starting from the BOTTOM UP on the stalk. This protects the growing bud and allows the stalk to continue to grow new, perfect leaves, and of course.. BLOOM. This also opens the clump up a bit in preparation for the tremendous amount of new growth that is about to occur in Spring & Summer. Opening up the clump also allows the blooms to be easily seen and shown off. If only half of a leaf is tattered, I will cut it in half. I never cut the newest leaf completely off, as this can trigger the stalk to abort, and they are about to bloom. I will leave the newest leaf alone.. if it is bent or tattered, I will leave it and wait for the next one to come out before trimming it. The whole operation takes me about 30 minutes or so.